The selection of Peter Obi as the running mate of the Peoples Democratic Party, PDP has won more support for Abubakar Atiku, the party’s Presidential candidate in the South East of Nigeria. Alhaji Atiku, a former Vice President hopes he can replace President Muhammadu Buhari as the Commander-in-Chief of the country after the February 2019 elections. The former Vice President who beat the senate President Bukola Saraki and Governor of Sokoto Aminu Tambuwal to clinch the ticket of the major opposition party, has now received a massive support from a critical region where the party failed to gain grounds in the last elections. Although President Goodluck Azikwe Ebele Jonathan hails from Port Harcourt, the PDP lost votes in critical areas in the south east in the 2015 elections. This could be rectified in a few months time, as Alhaji Atiku, the Waziri of Adamawa has secured prominent Igbo support with the selection of a former Governor of Anambra. Ben Nwabueze, 86, a senior advocate of Nigeria, who is very prominent in the south east praised the man described by a former head of state as the next president to be. 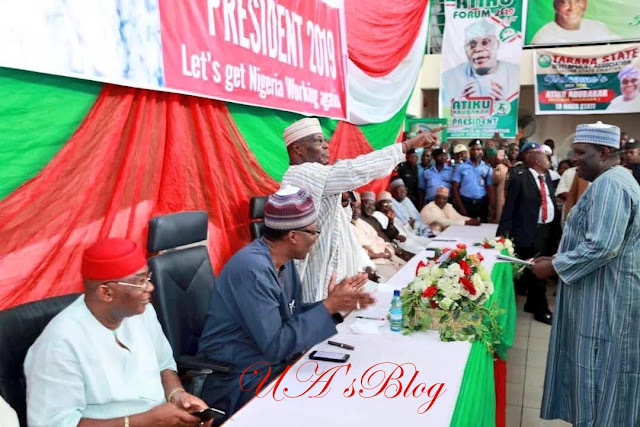 Professor Nwabueze, a prominent constitutional lawyer, according to those present at an event that took place in Enugu said it was his wish to see Alhaji Atiku become the President of Nigeria. Olisa Agbakoba, SAN, who was present at the meeting released a statement noting that they had decided to endorse Alhaji Atiku’s Presidential aspiration. He said: “The Igbo people of Nigeria held a one day non-partisan and inclusive summit convened by elders, traditional and religious leaders on Wednesday, November 14, 2018 to consider Ndigbo’s place in the polity especially in the light of the forthcoming 2019 elections. “The summit deliberated on the State of Ndigbo in Nigeria today especially after years of exclusion from the centre. This country has never been so divided, as it is today. We Igbos have always yearned for a level playing field with justice, equity and fairness. “The summit recognised the nomination of His Excellency, Mr. Peter Obi, former governor of Anambra State, as the vice presidential candidate of the PDP and fully endorses this nomination. It was acknowledged that this nomination puts Ndigbo back in the centre of governance. It is, therefore, important that Ndigbo should rally behind the Atiku/Obi ticket. “We identify with the Atiku/ Peter Obi ticket on the restructuring agenda as has been reiterated by four zones of the country namely, South-south, South-west, North-central and South-east. We believe that as long as the federating units remain weak the centre will continue to be weak. We equally move to appreciate the position of the Atiku/Obi ticket in promoting national unity.